Our weather here in the Bay has been amazing, just like spring. 🙂 It’s still cold at night and in the mornings but still chilly enough for the winter warming goodness of soups and chowders. I live 100 metres from the ocean and no matter where you live in New Zealand the ocean isn’t that far away, so I am very ashamed to say….wait for it….shock horror…..I just don’t enjoy eating seafood that much. I don’t mind fish but I’m not at all keen on shellfish or crustaceans. It does embarrass me, I feel so bad like I should be shot for treason or something and when I mention it to people I can tell they are saying to themselves “pfft a cook who doesn’t like seafood” I can sense their distaste! I just don’t like the texture or smell of it and don’t even show me a tentacle or an eye of anything like that…..ever. I was brought up in an oceanside town and I do love the sea. 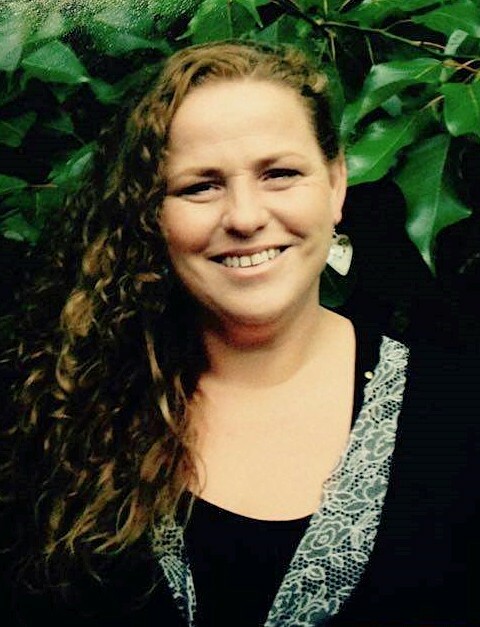 My family loves seafood and when I was small my favourite things to do was forage for paua around the rocks all afternoon or to spend hours digging my heels in the sand looking for pipis with my nana so I don’t really know what went wrong! I mean I know seafood tastes great (the whole world can’t be wrong), I’m just weird. Fortunately, I love cooking it for everyone else! 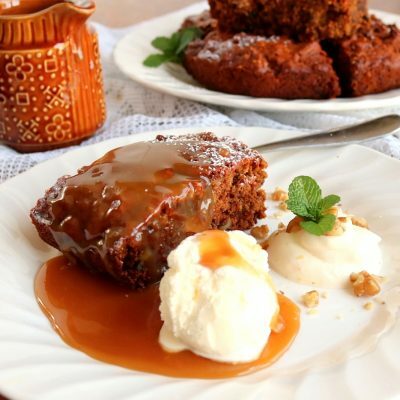 This recipe was passed on to me from a Chef I worked with so I’m not sure where it came from originally and I’ve only changed the measures and ingredients slightly because it was already perfectly delicious! It’s a favourite with my customers and if I run out they give me a lot of grief! It’s wonderfully thick and creamy and loaded with seafood. It’s perfect to make for a special occasion or if you are having a dinner party especially as the very first chowders were made as communal dishes. This particular lot was made because I was given some Tarakihi (a popular NZ fish) and I didn’t have time to cook it that evening so I had to freeze it. 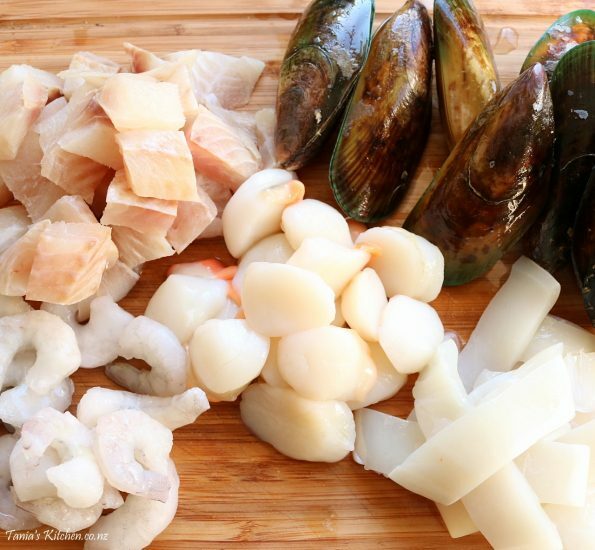 Seafood is best eaten fresh of course so chowder if perfect to make if you have some frozen. Interesting fact (interesting because some of it has to do with PIRATES!) – The word Chowder originates from a few French words; ‘caudron‘ cauldron, ‘chauiere‘ a forged kettle and the French words ‘faire la chaudiere’ meaning fish soup. Despite the French origin of the name there is no record of Chowder originating in France or England. The word Chowder was first seen In 1870, in the fishing hamlets of Brittany, with the French words ‘faire la chaudiere’ probably arriving there with the French fisherman. It also meant a communal pot where the people of the Brittany coastal towns would each contribute something, the freshest of fish, vegetables, spices and herbs and would equally share it. There were also sign boards in front of cabarets (pubs) which had in pirate language, “Ici on fait la chudiere or ‘here be chowder’. The earliest chowder recipes included pork and also dry crackers broken up on top and the very first published recipe was published in the Boston Evening Post in 1751. Potatoes were added in the early 1800s and although it was originally made with water, milk was added in the late 1800s. If you like to you can replace all the seafood with 4 cups of marinara mix. 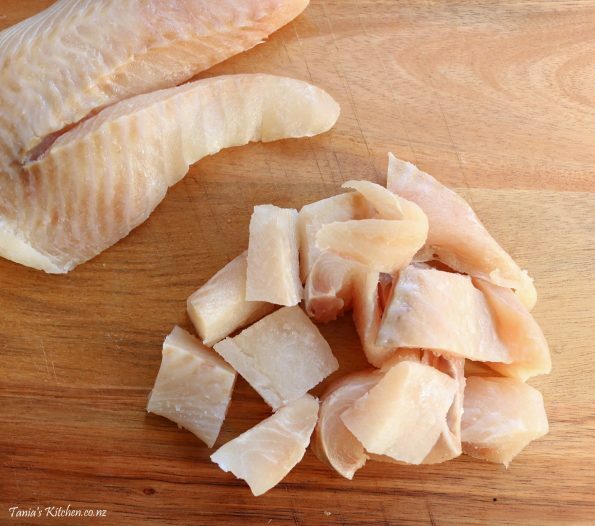 When using frozen seafood I remove it from the freezer a day before I am making the chowder and leave it to defrost in the fridge for a day…..playing it safe! It pays to only purchase closed mussels as some open ones may be dead, the healthy ones will open up when they are cooked. It can be hard to find seafood stock here and I find that liquid fish stock is not a suitable replacement (unless you make your own) it makes the chowder taste a bit ‘too’ fishy for my liking, but that’s just my personal taste. I think that the seafood gives it enough ‘ocean’ flavour without it being too ‘fishy’. Note* Since publishing this recipe Countdown has stocked Simon Gault’s ‘Off the hook!’ fish stock and it tastes amazing! 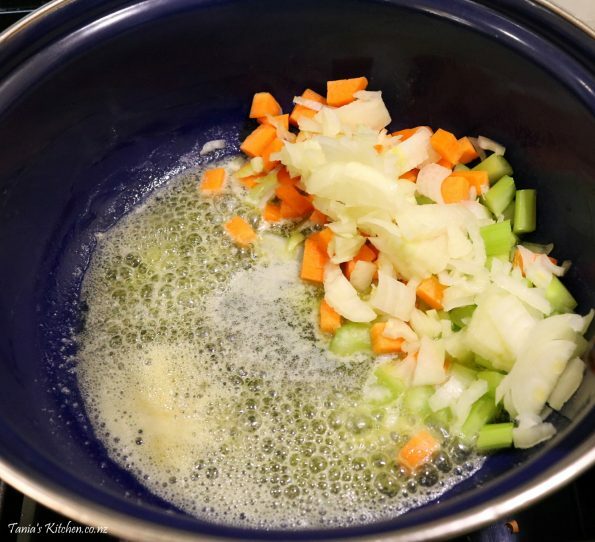 So….this chowder is really easy once you start cooking it…however there’s a bit of prep that needs doing first. So first prepare the vegetables. 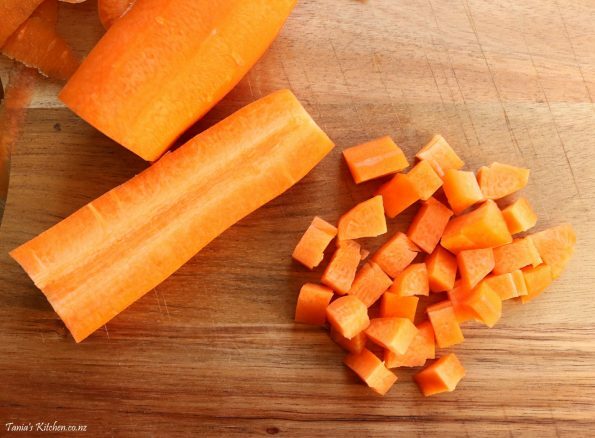 Peel and cut the carrot into 1/2 cm cubes (1/8 inch), they don’t need to be perfect just around that size. Just keep in mind that my cooking times are for the vegetables cut this small. 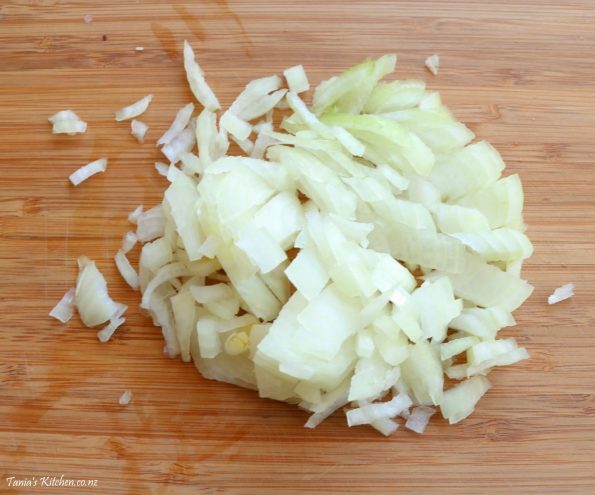 …..then peel and finely dice the onion. 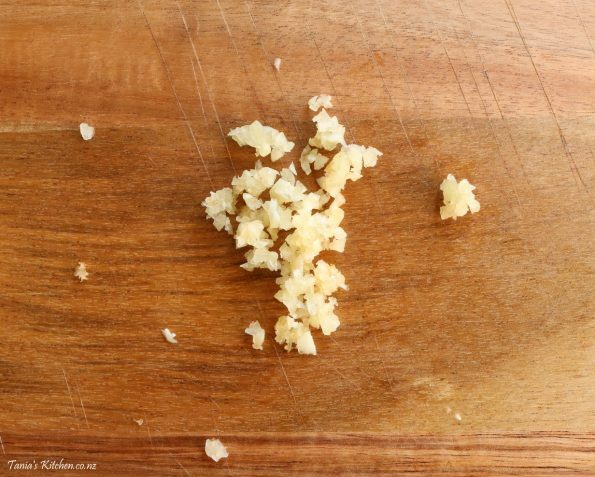 Next peel and crush (or very finely dice) the garlic cloves. 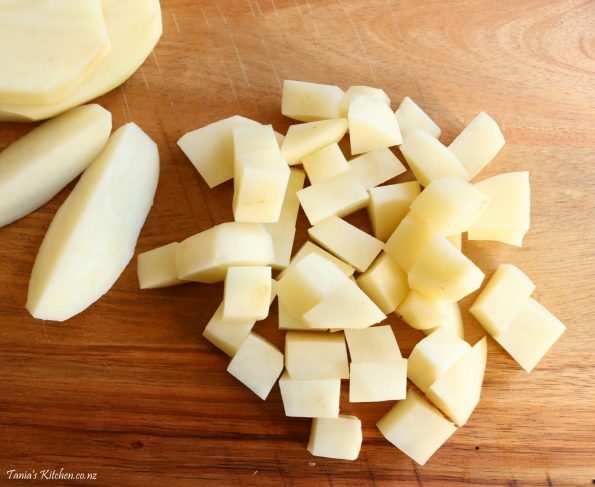 Also wash, peel and dice the potatoes, also into 1/2 cm cubes (1/8 inch), no bigger for these or they won’t cook through. Now to prepare the seafood. Check the fish has no random bones and then dice it roughly into 2 cm (3/4 inch) pieces. 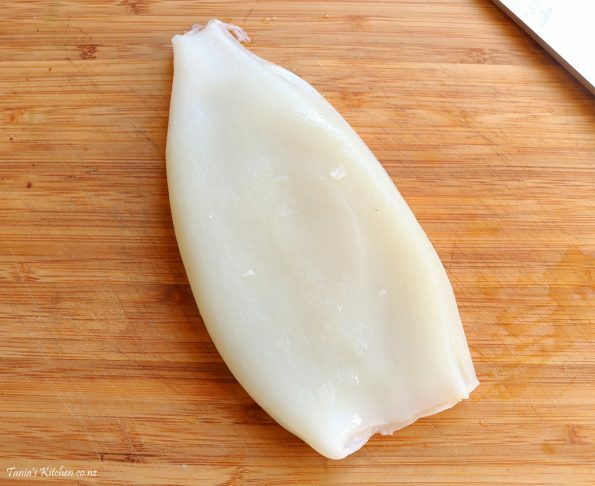 Then get the squid tube and…..
…..cut it open down one side. 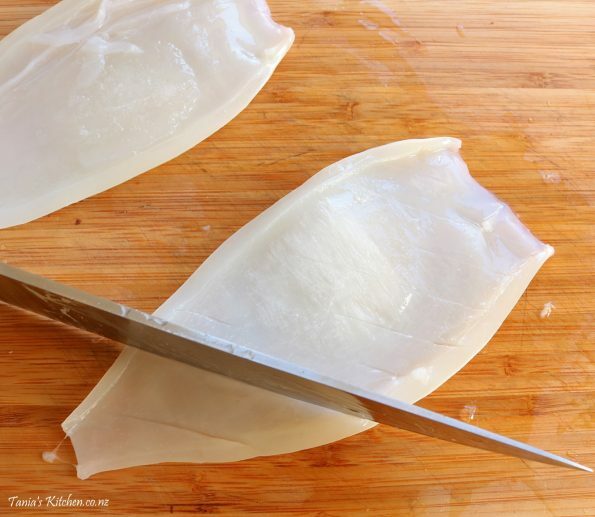 Next with both pieces of squid, using a small sharp knife make slices on an angle, being careful not to cut it all the way through the squid. 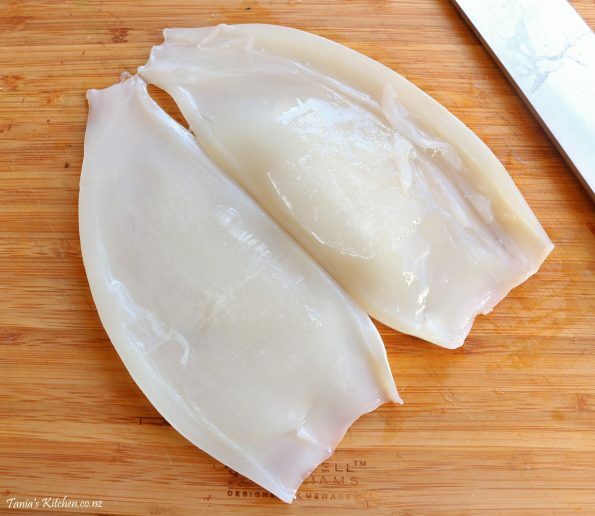 This tenderises it and helps it to curl up when cooked. 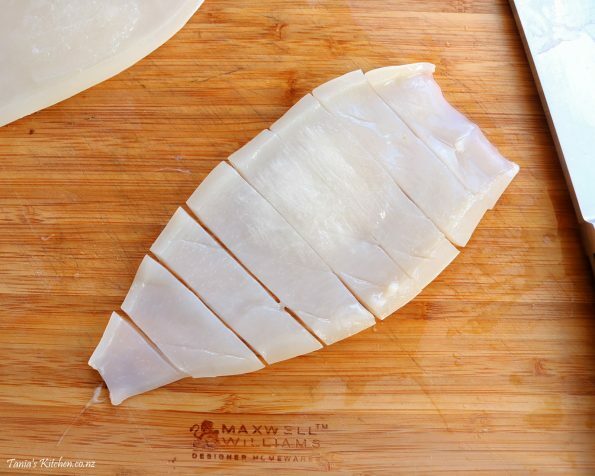 Then slice it into 1 cm (1/2 inch) strips, widthways. Now thoroughly scrub the mussel shells and remove any remaining beards. Mussels attach themselves to rocks using thin, sticky membranes called “beards.” Most farm-raised mussels will come de-bearded but if you find some brown, grassy looking ‘stuff’ sticking out of the shells, pull it downwards towards the hinged end of the shell. Pull firmly until it comes out and then discard it. Also, add the scallops to the seafood bounty and return it all to the fridge until needed. Just two final things for the prep and that’s to get the turmeric ready and to weigh out the flour. So now you are all prepared it’s time to make the chowder. Add to a very large saucepan the butter. Over a medium heat let it melt and then start to bubble. 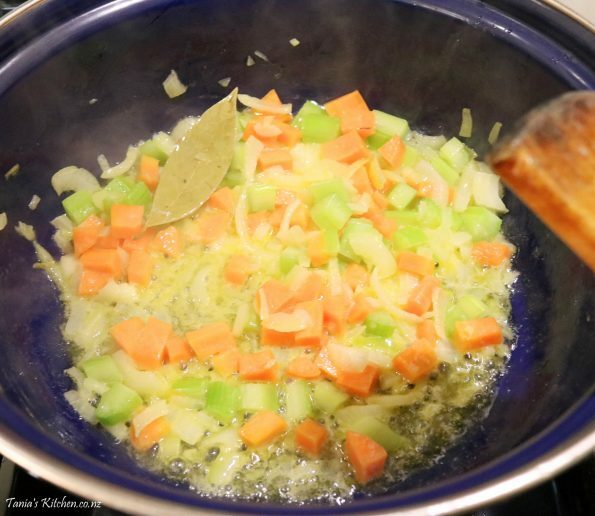 Quickly add the diced celery, carrots, onion and the bay leaves. Stirring often, saute them for 5 minutes (the carrots will continue to cook through later, you are just softening them at this stage). Add the garlic and continue cooking for 1 more minute, still stirring often. 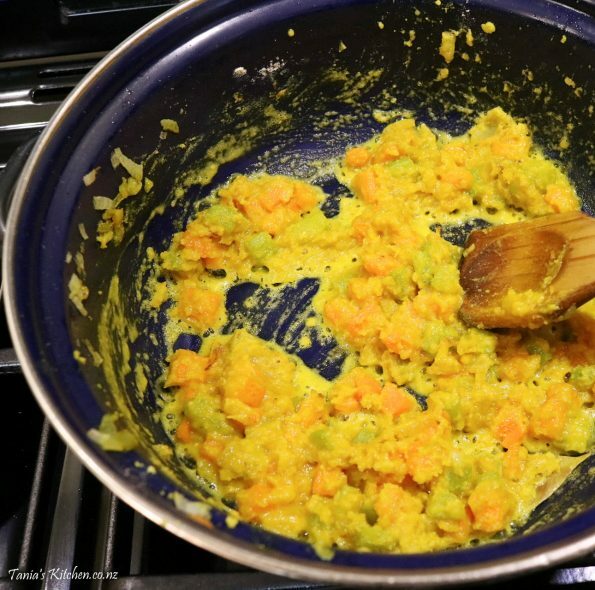 Then add the turmeric and…..
…..stirring constantly, still over a medium heat, cook the flour off for 3 minutes. Now add the stock and the potatoes, stir it all together and then turn the heat up to high and bring it all to the boil (this might take a while). 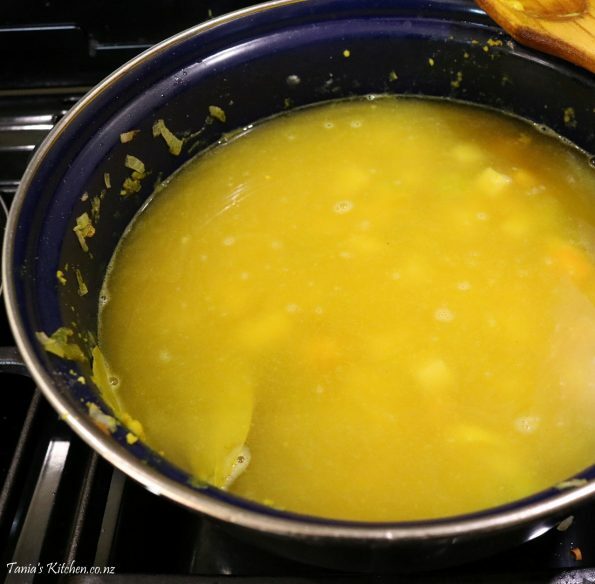 Once it’s boiling turn the heat down to medium/low or a temperature where the stock is simmering (a gentle/soft boil). 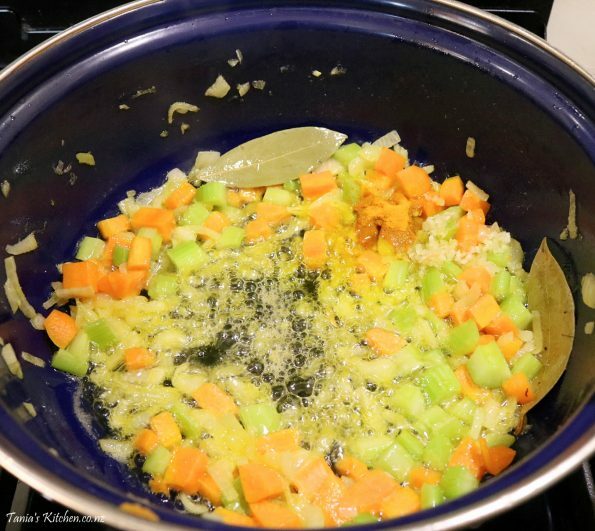 Now simmer it for 15 to 20 minutes or until the potatoes are tender and cooked through. 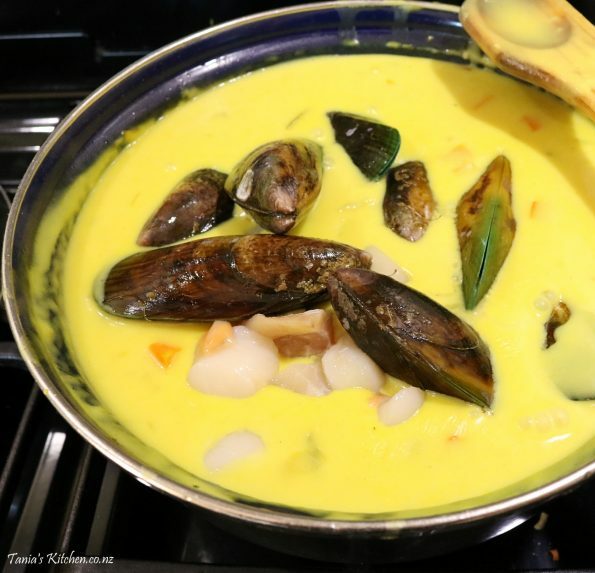 Once the potatoes are soft add the cream and…..
…..all of the seafood and the pepper and continue cooking on the same heat (a simmer) for 10 minutes or until the seafood is cooked (of course this may require a taste test). 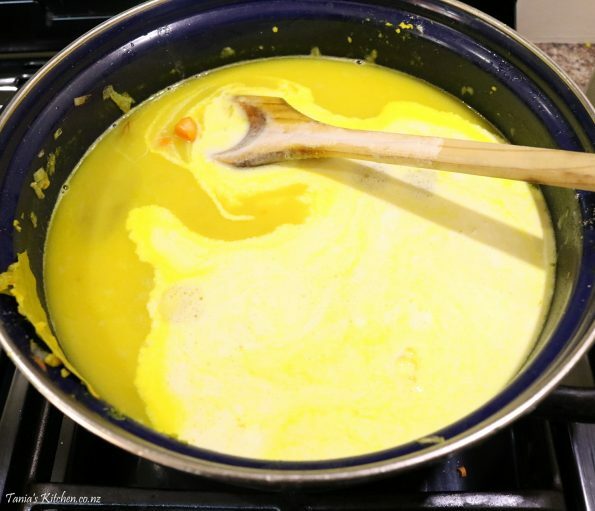 Make sure you stir it often as it’s so thick it will stick to the bottom of the saucepan if you are not careful. Test the chowder for saltiness, if you feel it’s not flavoursome enough you can add 1/4 teaspoon of salt (or an extra teaspoon of dry stock). Remove the bay leaves or warn your family or guests that they are in there and to just to leave them on the side of the plate as they are too sharp to eat (and taste bad, lol). Storage – Store well covered in the fridge and assuming the seafood was fresh (also fresh when it went into the freezer) it can be enjoyed within 3 days. Make sure that like with all meats and seafood that it is put into the fridge within two hours and when reheated it’s very hot. 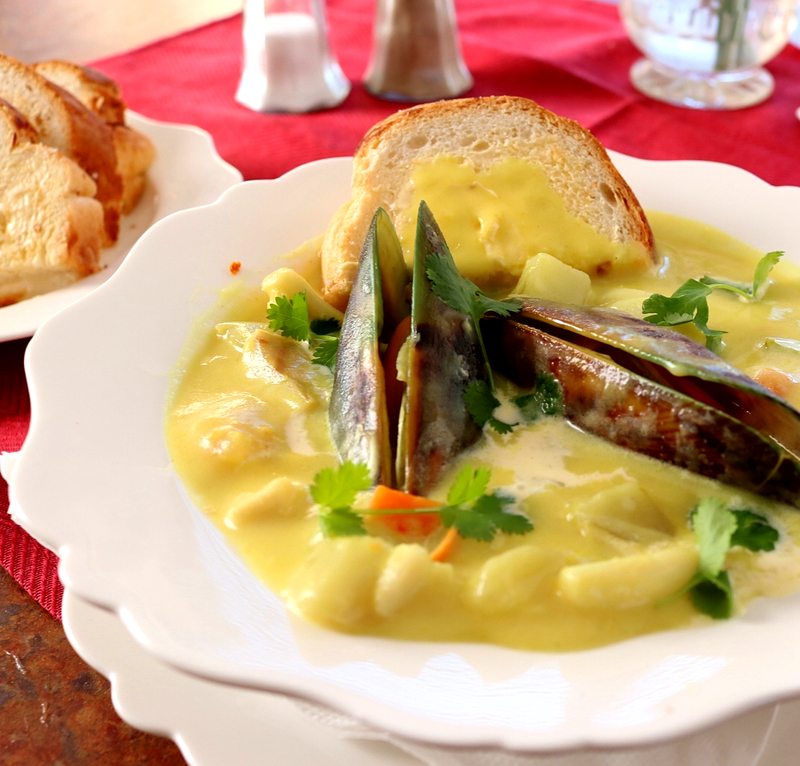 Loaded Creamy Seafood Chowder! So much seafood, so much creamy flavour! 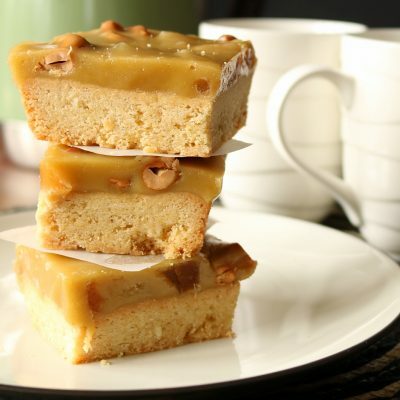 An awesome winter warmer enjoyed with a crusty, buttery slices of bread. 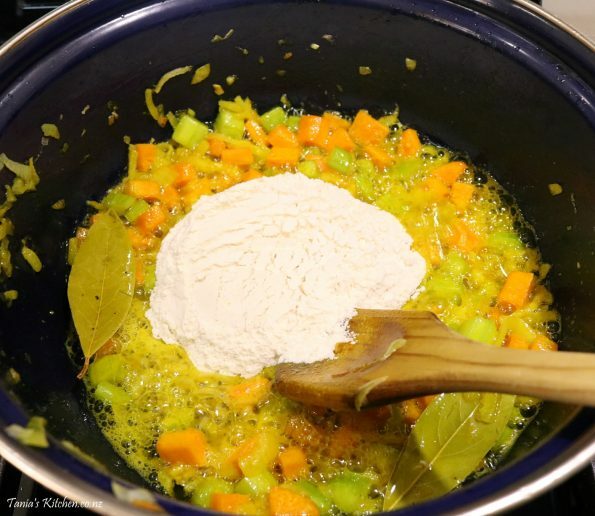 Can I puree this soup with 100 % of ingredients? Thanks Tania! I’m in Auckland now but grew up in Taradale, so not far from where you are I guess. I cooked this for my wife and 16 month old son and it went down a treat. My boy devoured a couple of chowder soaked bread rolls with the veges and fish. Am plying him with water now as I didn’t expect him to hoe into an adults dish with such enthusiasm! 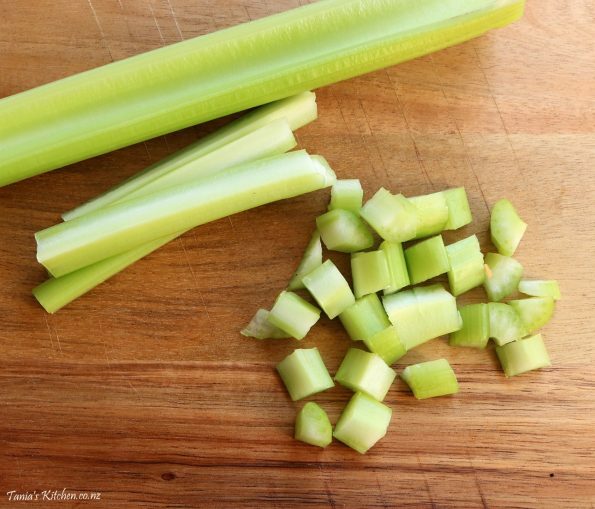 FYI we had a bit of leak that needed to be used so I added that with the onion and celery… worked well I think. 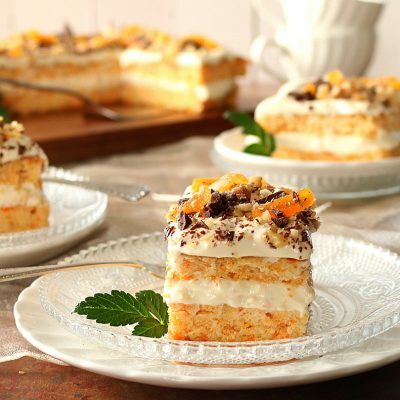 can you freeze this recipe Tania – I’d like to make it today but know I won’t be able to eat it all within 3 days??? Whenever we have fresh prawns, I boil up the shells and freeze the liquid. It’s a really tasty stock to use in chowder and fish pie. Hi Liz 🙂 That’s a good idea, I guess it would make a nice subtle stock, thanks for the great tip! 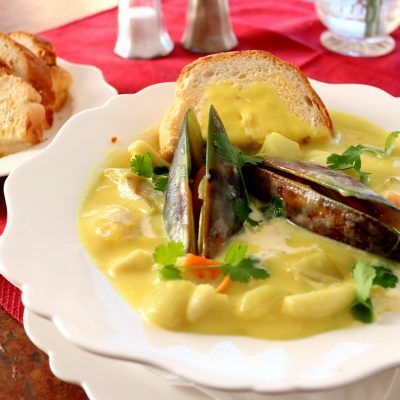 My husband and I tried seafood chowder during our holiday in NZ and we really love it so today I’ve given it a try and cooked it at home (in Germany) with your recipe. It has turned out really delicious even though I couldn’t use any of the great NZ types of fish, of course. Wow, this was a great success at my place. Thank you for a wonderful recipe. I’m so happy you enjoyed it! I would never have thought to whip up some chowder for the rugby, what a great idea and what a game eh!! Abso,utely fabulous. . Have sent he recipe to my kids in Italy and New York. I hoping to make this tonight, I’m thinking maybe add some fennel. What are the thoughts on this?. Ok i dissent (lol) add the fennel but added some parsley and some sundried tomatoes and a left over white wine maybe more than a cup. I did reduce that . The combo i feel worked. I live in Australia born in Bluff NZ so next time i’d like to incorporate the Bluff Oysters but be warned they are strong I’d recommend use them to make stock and don’t add salt at all. The best eva but need 2 make 2 x recipe!!!! 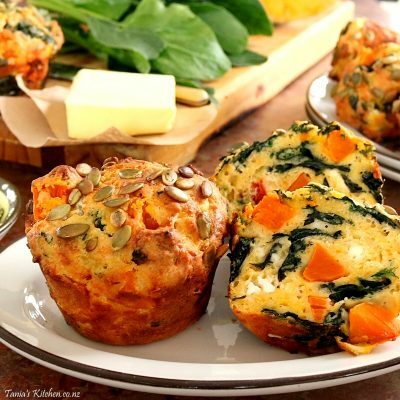 Easy to prep & cook soooo tasty!! Totally delicious. Best seafood chowder we’ve ever eaten.